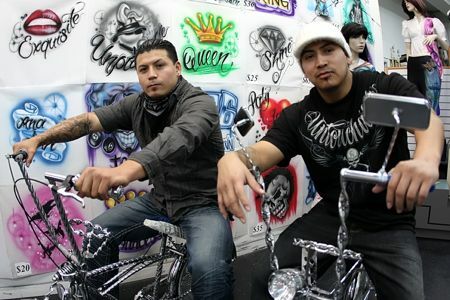 Alex (left) and Smiley (right) on their lowrider bikes in the shop. See more photos in an audiovisual slideshow here. Francisco Antonio Flores-Renteria came to the U.S. three years ago. When looking for a place to have the portrait done — his second tattoo — he looked no further than Dzul Studio— a place that was clean, where he trusted the quality of the art, and where he was able to converse in his own language. The studio, run by brothers Alejandro (“Alex”) and Jacob (“Smiley”) as well as piercing-artist sisters Catalina and Elizabeth, takes the family name to heart: Dzul is a Mayan word meaning master or leader, one who stands above others in character or reputation. And that reputation has been built up over the last decade. After four years of doing airbrush art at weekend swap meets and homemade tattoos for friends on the side — and discovering fairs like Bite of Seattle, Bumbershoot, Hempfestand Portland’s Cinco de Mayo celebration — the brothers had amassed enough capital to open a studio. Smiley, the studio’s resident tattoo expert, is a master of the more urban black-and-gray tattoo style, but is also a talented tribal and color artist. About 80 percent of the art done at Dzul is original, and while the brothers have “flash” designs premade — reusable and template art — they’ve found that people are more interested in art that speaks directly to them, and that both parties are often more excited to do unique work. While the Dzuls cater to their culture, only 30 percent to 40 percent of their clientele is Hispanic. Instead, they draw on the many ethnic and age demographics that tattoo culture has infiltrated, as well as their clients from places as far away as Everett and Vancouver, B.C., who travel specifically to visit the White Center studio. The siblings, all Queen Anne residents, are currently looking to either move or expand to a location somewhere closer to the center of Seattle. One of their main reasons for originally choosing the shop’s location was its affordability for young artist-entrepreneurs. In addition to massive updates to the studio’s Web site — including an education-focused FAQ section — within the next year, Dzul also plans to launch a clothing line and sponsor an art exhibition with a Day of the Dead theme featuring original art, tattooing and photography. In the words of Alex, who studied graphic design at the Art Institute of Seattle, artists always need a community of other people who share their passion. And, luckily for these four siblings, that artistic community is also blood.